I love Tunisian crochet it's beautiful and works up easily its slightly like knitting but since I have never been able to fully grasp the skill of knitting this is much easier for me. 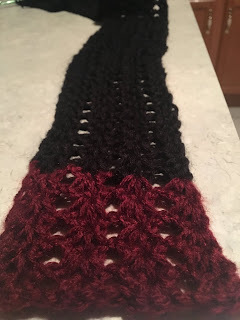 I learned basic Tunisian crochet when I stumbled across a video on youtube while I looked for scrap yarn project ideas, I don't remember the exact video I watched to get started with this but I really enjoy this video. It's nicely done and does show the basic stitches well. Once I understood the basics I wanted to start pushing myself into more complicated stitches and building up a decent set of skills. Being a lover of lace I thought this crochet style could make absolutely beautiful lace patterns. I set out looking for new stitches to learn and I found this lovely tutorial Tunisian Lace I loved the design and I think for my first time trying it out it ended up looking stunning. It is relatively easy to do once you get the basics down and is an excellent stitch to learn. It will make beautiful scarves and if you are more advanced than I am would make a very nice shawl.